The Washington Art Walk will be held Friday, April 11, from 5 to 8 p.m. and Saturday, April 12, at various locations in Washington. Some locations will only be open Friday. work at The Depot Gallery, 310 W. Front St., Friday and Saturday. Gary Lucy, Jeanne Miller Wood and Chris Stuckenschneider will show their work in the Gary R. Lucy Gallery, 231 W. Main St., Friday and Saturday. Miller Wood and Stuckenschneider will sell and sign copies of their recent book “My Washington.” Visitors also can see Lucy’s works in progress. NEW HAVEN, Mo. 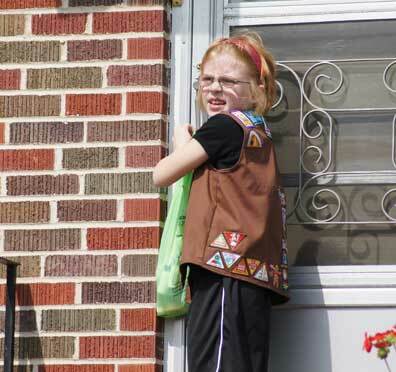 - Girl Scouts will distribute white, recycled plastic bags door-to-door throughout the Council’s jurisdiction, April 4, 5 and 6. Residents have until April 12 to fill their bags with the listed items. Residents who do not receive a bag on their doors can visit a Showering the Community Event at local Walmarts on April 5. Besides Walmart, Emerson, Dierbergs and Schnucks all partner with Girl Scouts for April Showers. During Showering the Community, Girl Scout troops stand in front of Walmart stores, some wearing raincoats and galoshes or holding umbrellas as they hand raindrop-shaped lists of needed items to people. Girls encourage customers to buy some of these items as they complete their own shopping. Participating shoppers then hand the items to the girls at the stores’ exits. Hermann, Mo. – Sausage makers from all across Missouri will gather at Stone Hill Winery this weekend for the 35th Annual Hermann Wurstfest. Saturday at Stone Hill Winery’s pavilion visitors will have the opportunity to test the large variety of sausages from vendors, including famous local vendors. Visitors will also be able to purchase their favorite sausages to take home and enjoy. A FUN 5K run/walk to benefit the Hermann area Crusade Against Cancer and our local food pantry will be held Saturday March 22nd at the Hermann Middle School. The cost is $20 per person which includes a free t-shirt. Registration forms are located at local businesses in Hermann, Mo, including the Hermann Area District Hospital, Hermann Fitness Source, Battocletti’s Bake Shoppe, and Hermann High School. 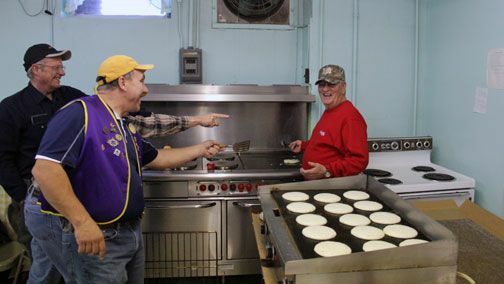 Over the years the way they make the sausage, eggs, and pancakes has changed with the times but Lions Club Members still have fun doing it. NEW HAVEN, Mo. 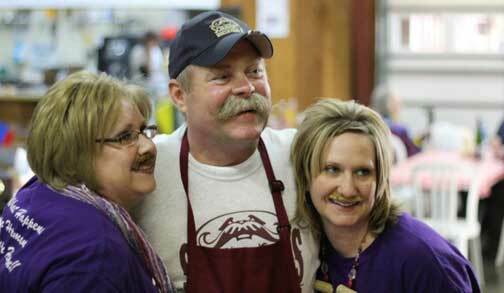 - The New Haven Lions Club held their Annual Pancake Supper earlier this evening. Ironically today also happens to be National Pancake Day and Fat Tuesday, both with a significant history and their relation to Easter. Tonight an estimated 300 people were served approximately 1500 pancakes, 60 pounds of sausage, and 90 pounds of eggs. While the tradition of having the pancake supper on Fat Tuesday has remained the same several things have changed over the years. New Haven, Mo. - Craft some gorgeous all occasion cards with Barb Kandlbinder. 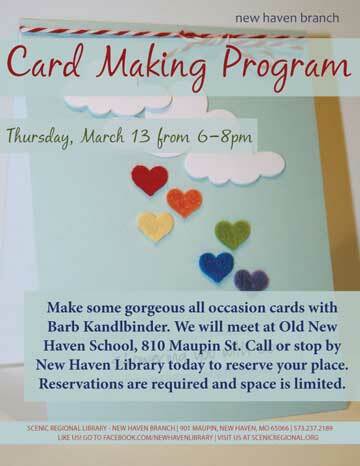 The program is planned for Thursday, March 13 from 6-8pm at Old New Haven School. Barb has chosen pretty materials from the Simply Delightful paper collection from My Mind's Eye. Everyone can make at least two cards, envelopes included. Pictured above David Engelbrecht and Kim Kohlbush present High School Principal a check during Tuesday night’s boys basketball game. New Haven, Mo. - In March of 2012, Citizens Bank began offering Shamrock and R-2 Huskies debit cards through their school’s spirit debit card program. 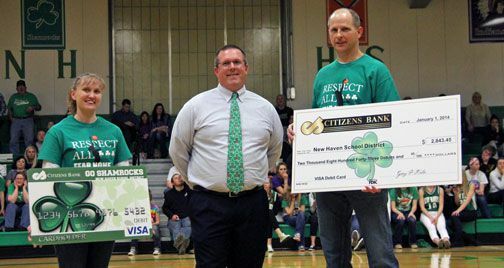 In 2013, Citizens Bank donated $2,006 to the New Haven School District and $437 to Franklin County R-2. Since launching the spirit debit card program they have donated over $17,000 to six different local school districts. Union, Mo. 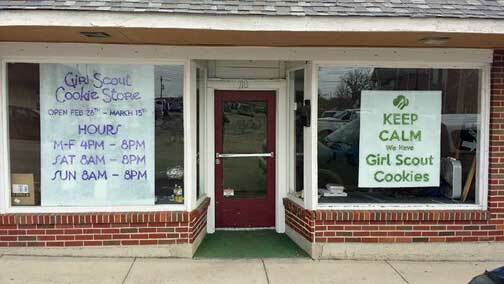 - For 16 days, starting February 28, multiple Girl Scouts of Eastern Missouri troops from the Union area will take over Philly’s Pizza Parlor to set up a Girl Scout Cookie Store, located at 118 S. Oak Street. Customers will be able to buy all eight Girl Scout Cookie varieties – Thin Mints, Samoas, Tagalongs, Do-si-dos, Trefoils, Savannah Smiles, Dulce de Leches and Thank U Berry Munches – for $4 per box. 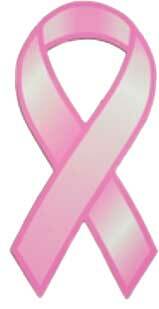 8 am-8 pm until March 15, 2014. New Haven, Mo. 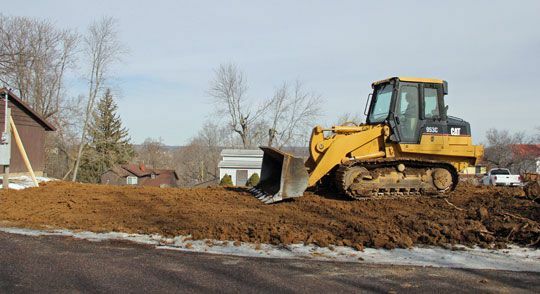 - Habitat for Humanity of Franklin County (HHFC) has begun digging the foundation for a new home that will be built at 205 Orchard Street. Habitat is looking for a partner family who would like to own a home, meets the income guidelines and is willing to work along Habitat Volunteers to build their new home.